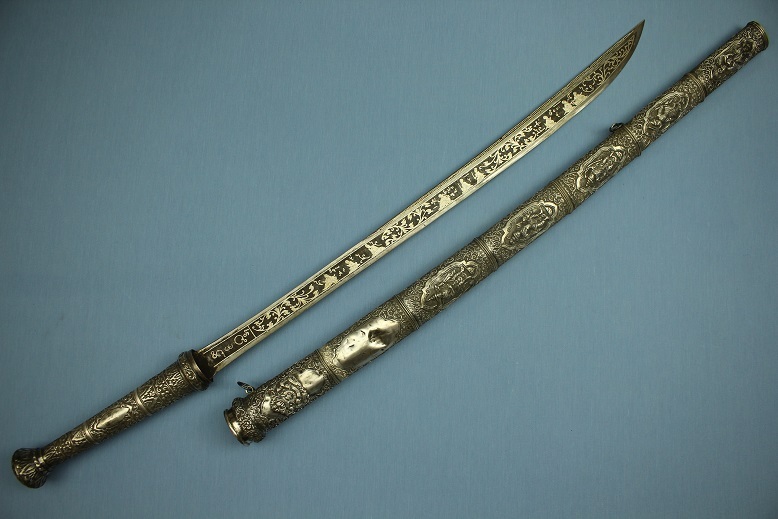 This rare presentation sword type is from the close of the British Raj in Burma, start of Burmese independence in 1948. 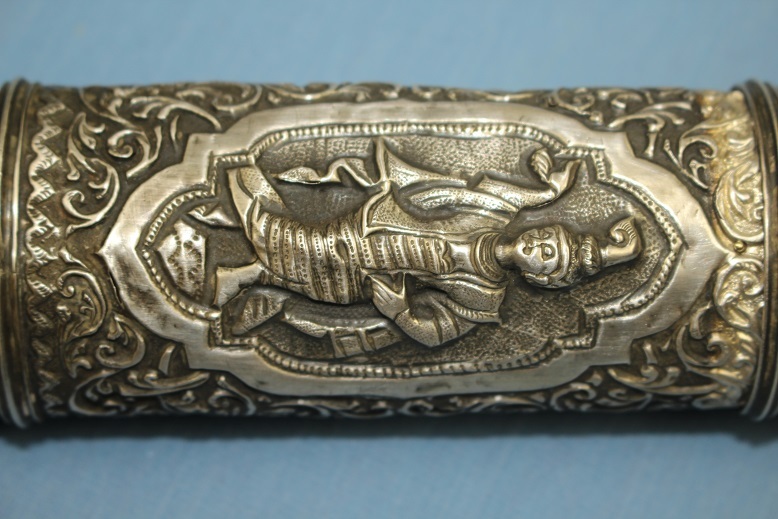 The Upper scabbard section bears a detailed repousse Burmese coat of arms, indicating a post 1948 construction. 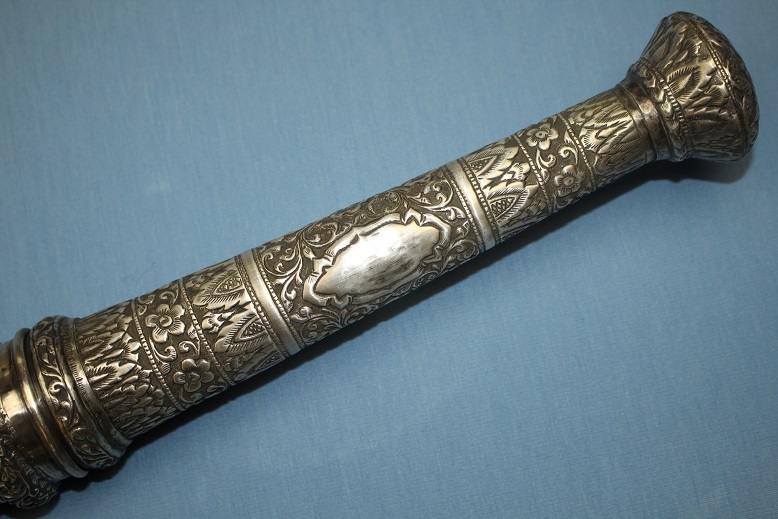 This sword, and all aspects of its construction and quality were long retained by the British and Burmese governments for presentation to officials or visiting dignitaries who have contributed to Burma. 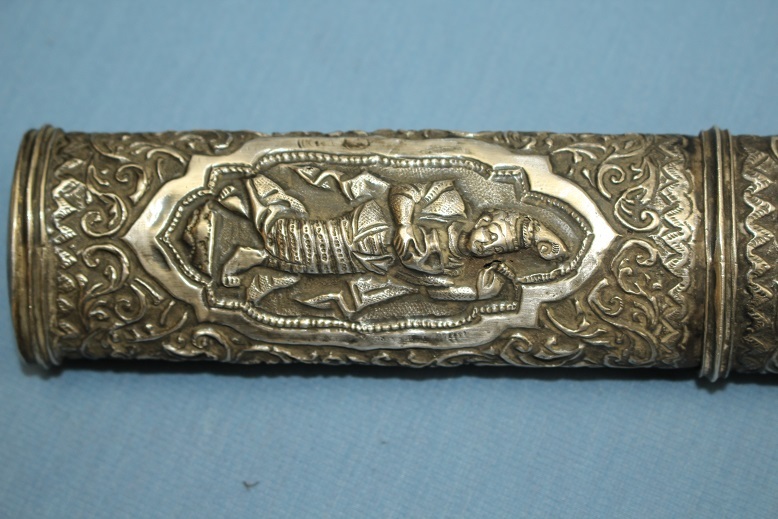 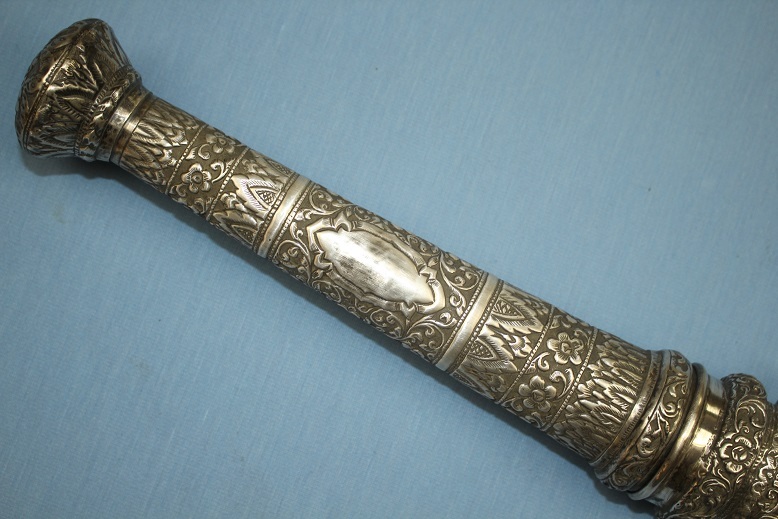 A similar sword was presented in 1955 to the Russian premier, an image bearing the caption, "Burmese Prime Minister U Nu, (R), presents a sword and scabbard, wrought in silver and engraved to Russian Premier Nikolai Bulganin at Rangoon. 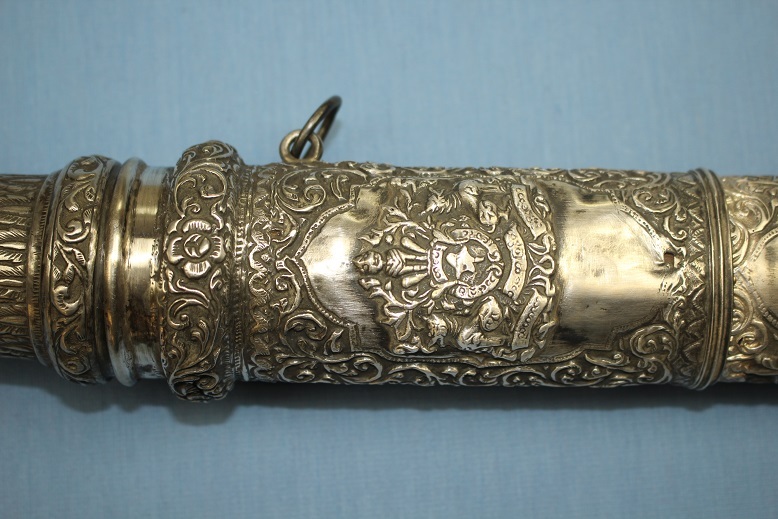 The ceremony took place during Soviet leader's state visit to Burma during December, 1955. 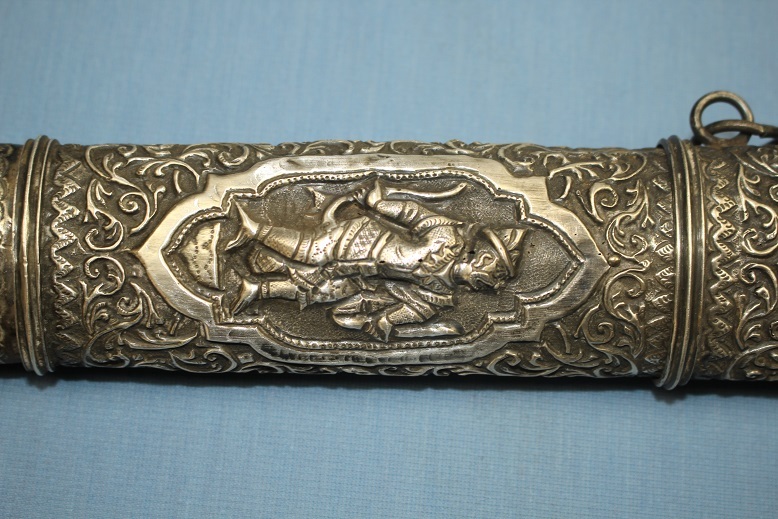 These sword types have a long history dating back to, as far as I can find with accuracy, the last quarter of the 19th century and seem to have followed a relatively similar form throughout this time with full silver hilts replacing what was once mostly ivory and silver hilts. 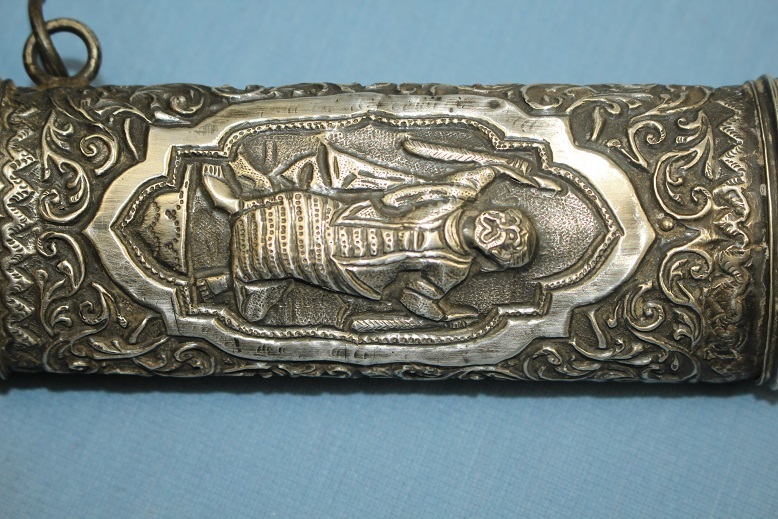 The blades too have followed a long and traditional form. 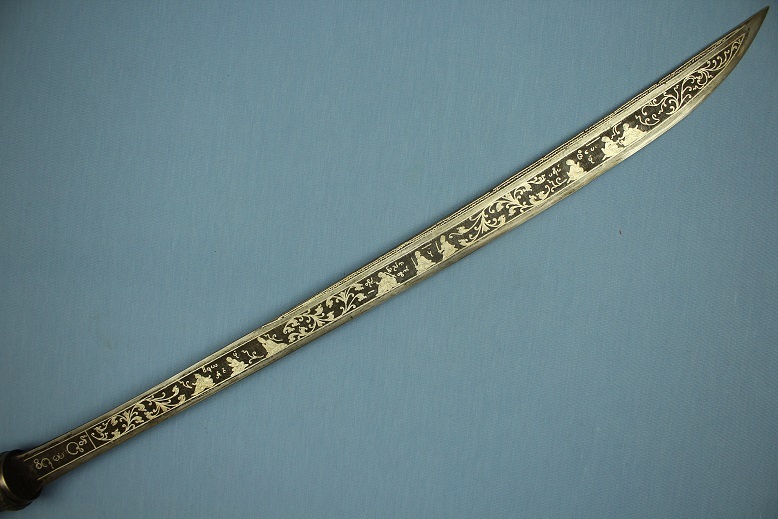 This Independence period presentation sword measures 102cms long in its scabbard, 92cms out and has a blade length of 68.5cms long. 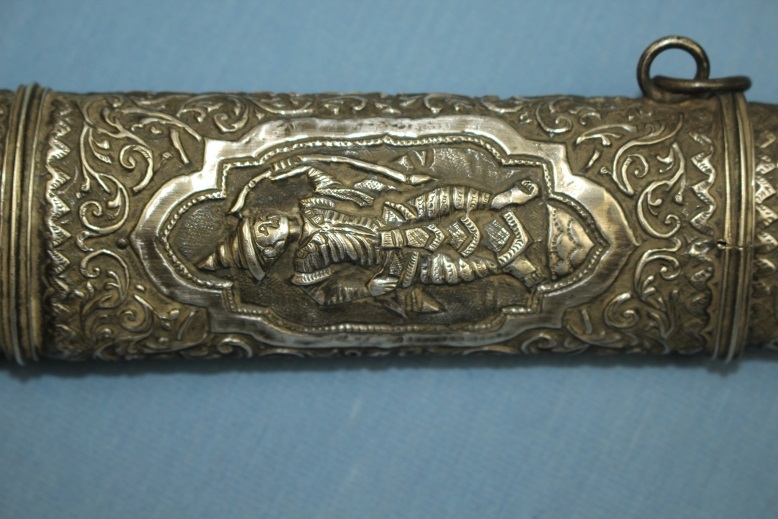 The hilt has two vacant cartouches and the upper scabbard section has a large single vacant cartouche. 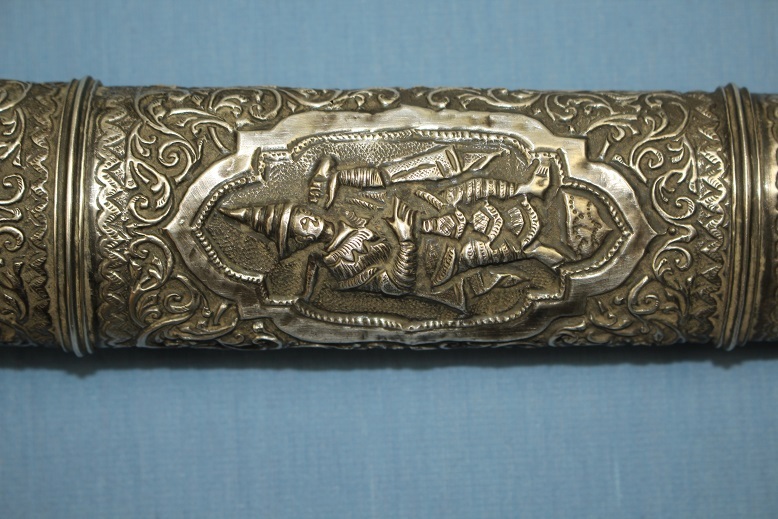 These cartouches typically carried the name of the person they were presented to. 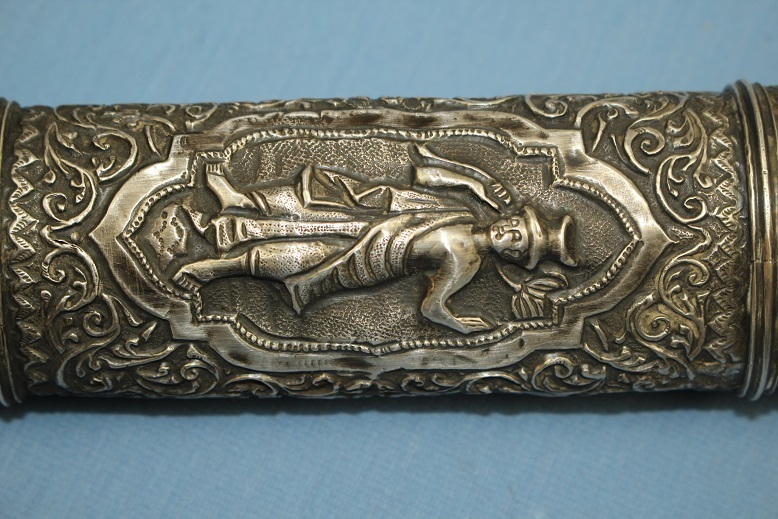 Examples I have viewed of 19th century manufacture have either Burmese script or both Burmese and Anglicised script present. 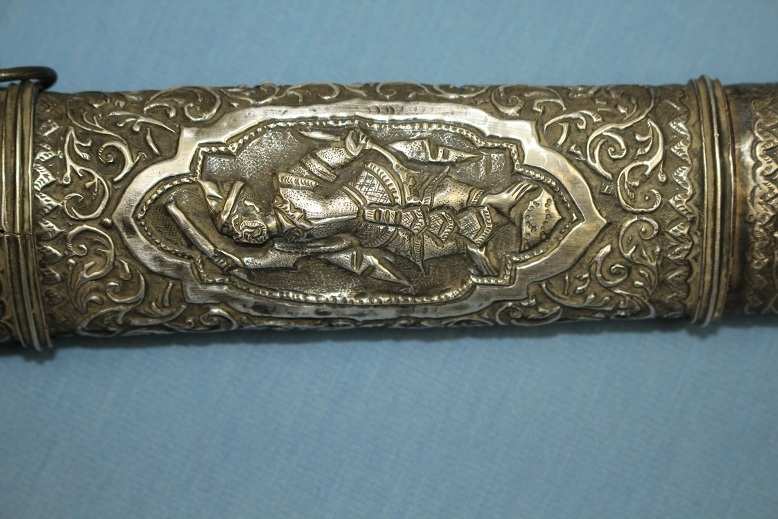 The scabbard of these oversized presentation sword types are of 7 panels of thick repousse silver. 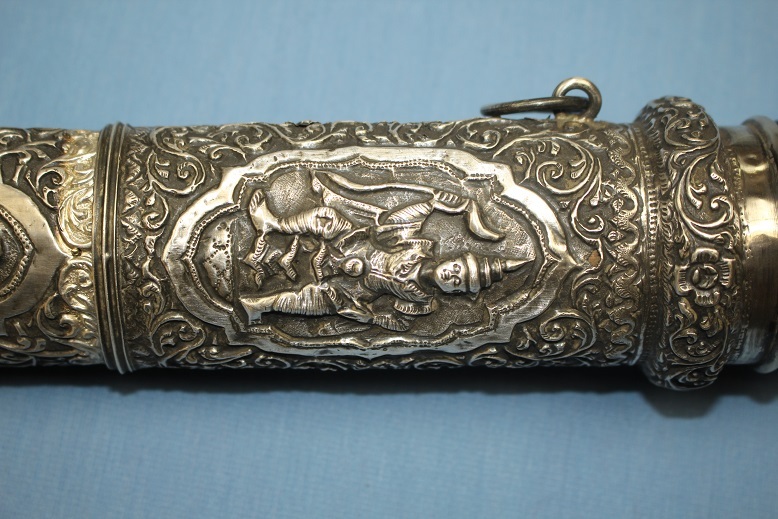 Although I have seen an example with 6 panels, it did to my eye appear to be lacking proper conformity of segments to have been made thus. 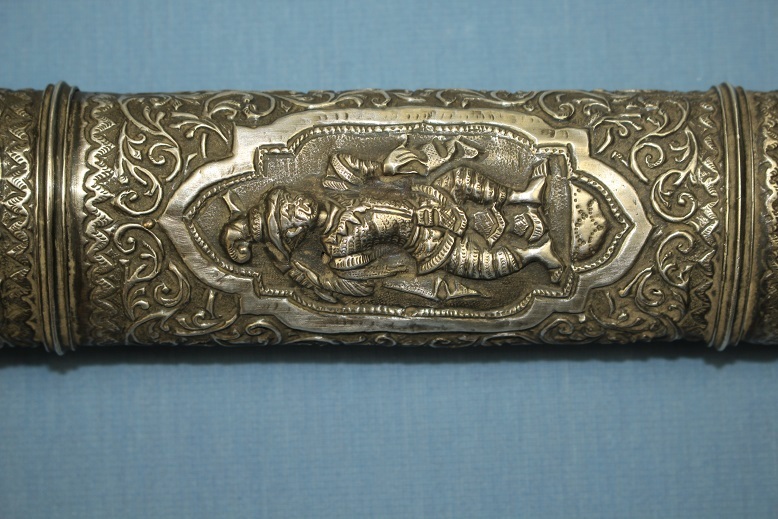 The characters displayed to both sides of the scabbard number 13 and are representations of the characters of Ramayana. 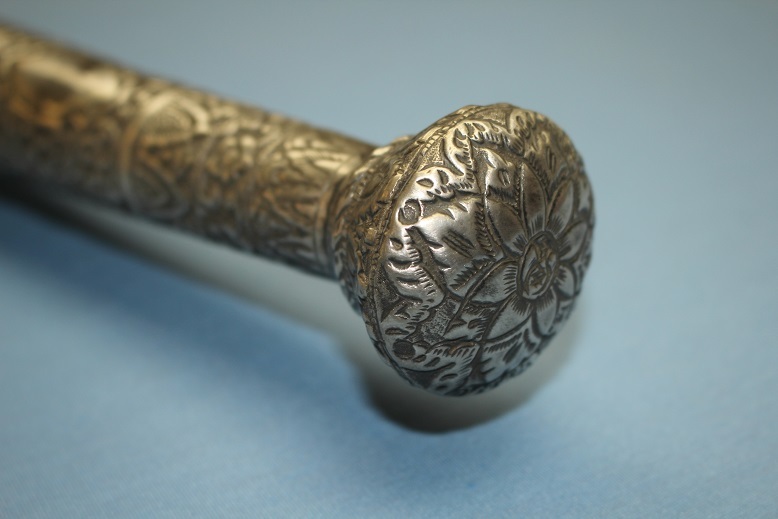 The blade is of traditional form and forged in the tractional manner and its hardened edge remains very sharp in places. 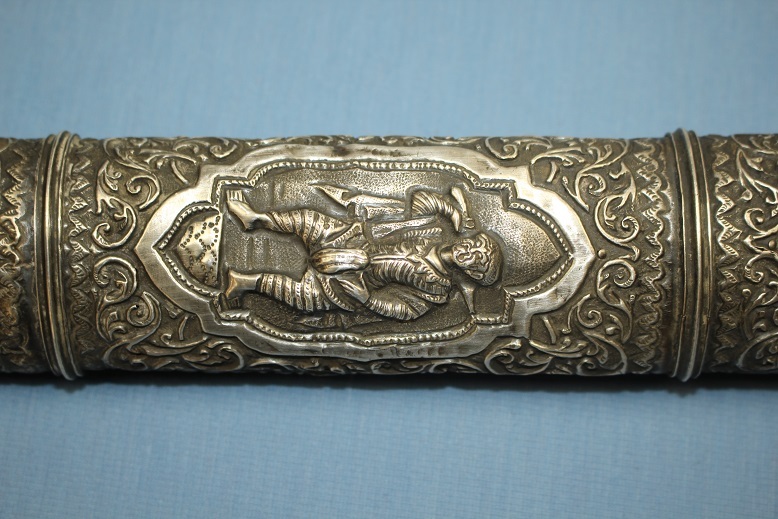 The blade faces profusely decorated with thick overlaid silver embellishment, further representing a story from Ramayana and is accompanied by Burmese text throughout. 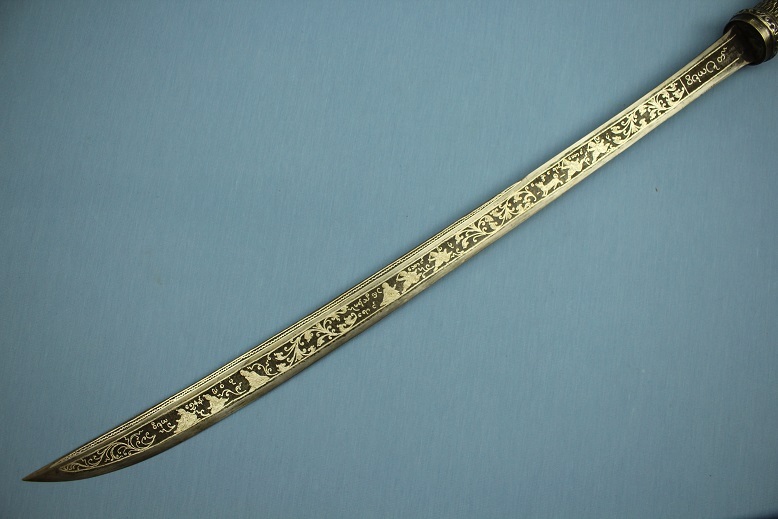 All figures and vine tendrils on the blade are engraved to provide detailed representations of the character. 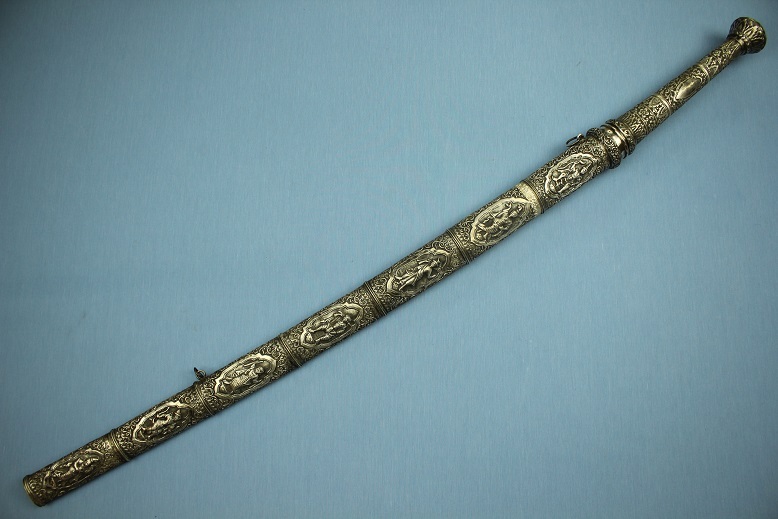 A very rare sword from the early independence period. 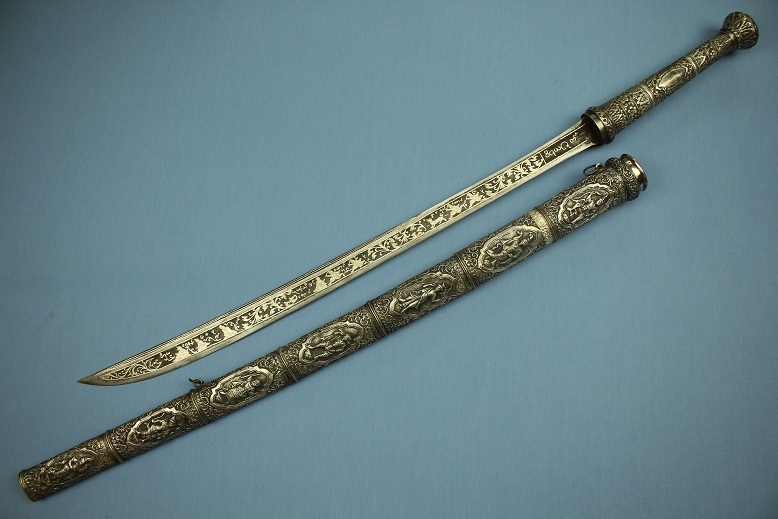 Presentation swords of this period are very rarely seen with 19th and early 20th century examples being seen more often. 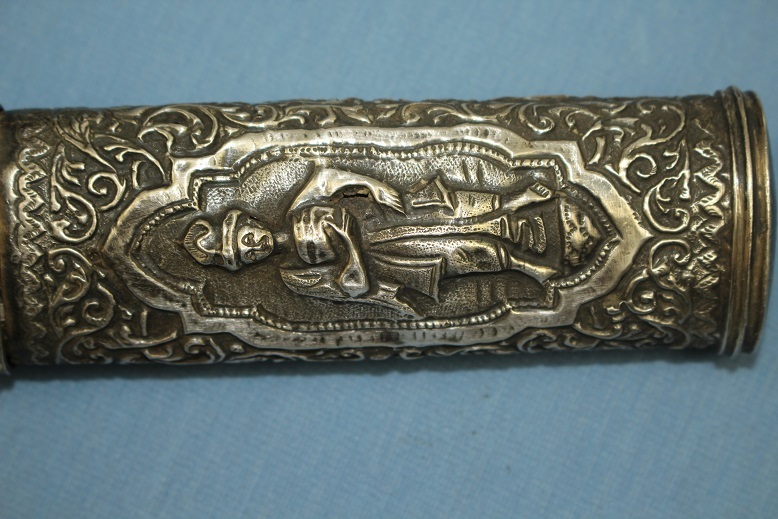 The sword remains in very good condition throughout and is in as found condition that would benefit from a full polish and wax.